I made this for dinner last night and it was so delicious, I knew I had to share the recipe right away. My husband and 2-year-old loved it and both went back for seconds. I love a good meal that my boys devour. That is one of the reasons I love cooking so much! It is all about taking care of the people we love. It makes me happy to create delicious, healthy, and gluten-free meals that help me and others do just that. And if we’re being honest the other big reason is just because I love to eat! This meal is a win-win-win as far as I’m concerned. It is most importantly so delicious! The chicken and rice are simmered in a flavorful mixture of peppers, garlic, onions and spicy sauce. 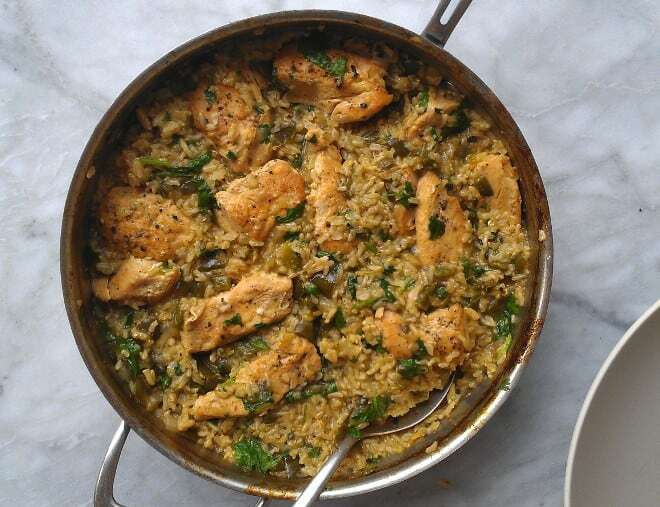 With a mix in of fresh cilantro and spinach before serving, it is bursting with flavor. It is also a one-pan meal, and who doesn’t love that. I am forever scarred by living in dishwasher-less apartments in college. Long live one pan meals! 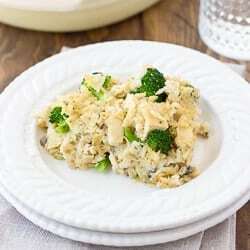 You can make this dish with either brown or white rice. I love the nutty texture and flavor of brown rice with all the spices, but you can easily make it with white rice for a quick 30-minute meal. I’ve included instructions for both. I hope your family enjoys this as much as we did! 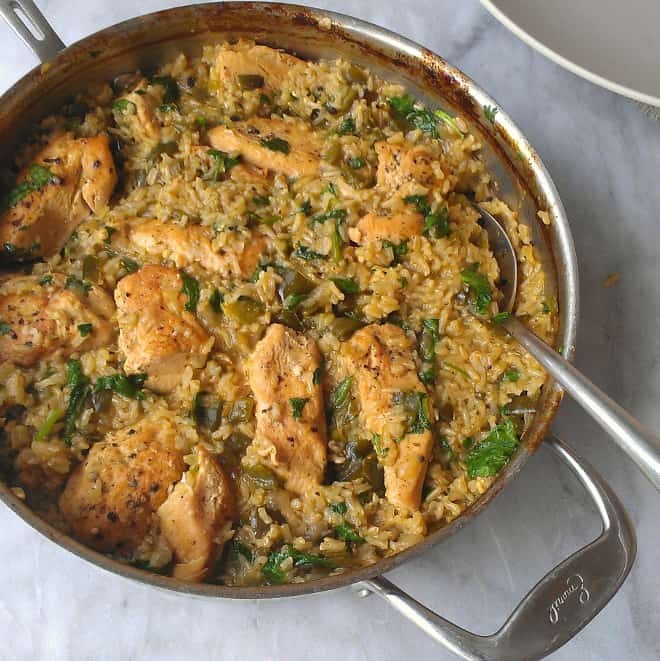 A one-pan meal with chicken and rice simmered in a flavorful mixture of peppers, garlic, onions and spicy sauce. A delicious weeknight meal! Preheat the oven to 375 F. Heat the olive oil in a large, oven-proof skillet. Season the chicken on both sides with salt and pepper. Add the chicken to the skillet and cook until browned on both sides, 3-4 minutes per side. You may have to do this in 2 batches. You don’t want to cook the chicken all the way through here. Just give it some color! Transfer to a plate. Add the onion and poblano to the now empty skillet. Add a touch more oil if necessary. Add a bit of salt and pepper and saute until softened, 5-7 minutes. Add the garlic and saute another 30 seconds. Add the cumin, enchilada sauce, chicken broth, and rice. Bring the mixture to a boil then nestle the chicken back in the pan. Cover the pan tightly with heavy duty foil so it is sealed. Transfer to the oven and bake for 70-80 minutes, until the rice is tender. Before serving stir in the chopped cilantro and spinach. Season with salt to taste. Enjoy! Skip preheating the oven. Follow steps 1-2 above as indicated, adding white instead of brown rice. When the mixture comes to a boil, add the chicken back to the pan. Cover and set the heat to low. Cook for about 20-25 minutes on the stovetop, until the rice is tender and most of the liquid is absorbed and the chicken is cooked through, stirring every five minutes or so to ensure the rice isn’t sticking to the bottom. I am so going to make this!! It looks amazing and I’m all about the one-pan-no-dishes approach! Looks really good! I’m thinking of making it tonight. Did you have any issues with the rice being overdone or too soggy because your liquid to rice ratio was off? Hi Amanda! The rice turned out perfect for me! 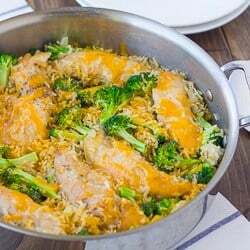 The green enchilada sauce counts for some of the rice cooking liquid. I hope it works for you! This looks really good! Will definitely put this on my ‘to cook’ list 🙂 Thanks for the recipe! I’m a little confused – is step 3 for the brown rice variation, or step 4? If you read through the instructions, it’s not clear. Thanks for pointing this out! I’ve changed the instructions. Hopefully they are more clear now! Let me know if you have any other questions. 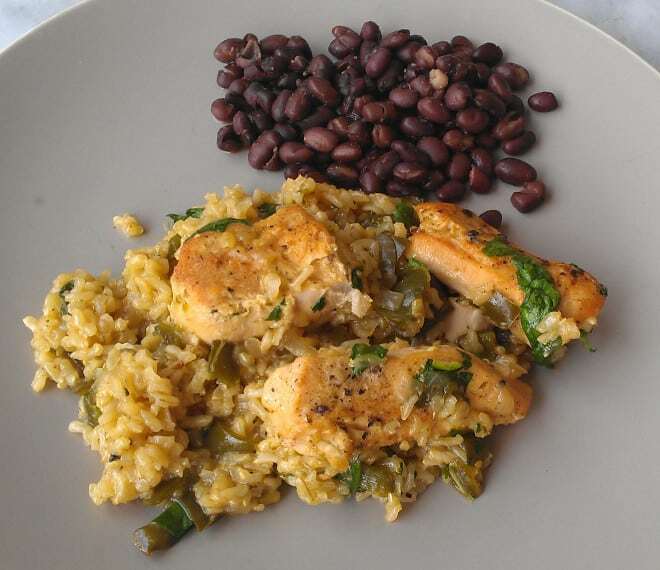 Sydnie Freeman pointed me to your blog for some great Gluten Free meals. And I love what I am seeing. I do have questions about this recipe. No the recipe actually, but what sides would you suggest with this meal? We are having some gluten free guests over and I am have a lot of trouble with this! Any help would be great. If you could reply with an email, even better! This looks delicious! Thank your for the recipe… cannot wait to try it! Such a good Mexican dish. We love this recipe! Just made this but substituted with chicken thighs. After they came out of the oven I shredded up the chicken and mixed in with the rice. So good! Great recipe! Made this tonight and it was fantastic!! Great recipe thanks for sharing. Tripled the garlic because we love garlic. Added a Serrano for some heat. Quick and easy and delicious! hey,i just wanted to say that the rice to liquid ratio is all wrong. I barely put one cup of rice and it came out good, but kinda mushy. There was no extra liquid left over. I think I will put less rice next time. The dish was great though, i rly liked it. I think you need to do the reverse. If you put the suggested 1 1/2 cups of rice, it won’t be mushy in the end because you’ll have more rice for the water to absorb, making each grain less mushy or water-logged. Hope that helps! Would this recipe work with wild rice? I haven’t tried it but the cook time might be different! Hi- love this recipe but the cooking time is off. If using regular rice (not quick cooking), it takes well over 90 minutes for the brown rice version, and over 55 minutes for the white rice version. It is super yummy, but difficult to plan when the cooking time is so much longer. It also needs amore cooking liquid due to the longer cooking time. 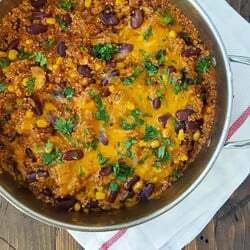 I tried this recipe tonight and it was a big hit!